ON GST RATE ON GOODS AS RECOMMENDED BY THE GST COUNCIL IN ITS 28th MEETING HELD ON 21.07.2018. Miscellaneous articles such as scent sprays and similar toilet sprays, powder-puffs, and pads for the application of cosmetics or toilet preparations. II. Refund of accumulated credit on account of inverted duty structure to fabric manufacturers: Fabrics attract GST at the rate of 5% subject to the condition that refund of accumulated ITC on account of inversion will not be allowed. However, considering the difficulty faced by the Fabric sector on account of this condition, the GST Council has recommended for allowing the refund to fabrics on account of inverted duty structure. The refund of accumulated ITC shall be allowed only with the prospective effect on the purchases made after the notification is issued. Circulation and commemorative coins, sold by Security Printing and Minting Corporation of India Ltd [SPMCIL] to the Ministry of Finance. IGST @5% on Pool Issue Price (PIP) of Urea imported on Govt. account for direct agriculture use, instead of assessable value plus customs duty. Beet and cane sugar, including refined beet and cane sugar, (falling under heading 1701) attract 5% GST rate. Kota stone and similar stones [ other than marble and granite] other than polished will attract 5% GST, while ready to use polished Kota stone and similar stones will attract 18%. GST Council in the meeting held at New Delhi on 21.07.2018 took following decisions relating to exemptions/changes in GST rates / ITC eligibility criteria, rationalization of rates/exemptions and clarification on levy of GST on services. The decisions of the GST Council enclosed as annexure has been presented in simple language for ease of understanding which would be given effect to through Gazette notifications/ circulars which shall have the force of law. (iii)Pension, social security and old age support. 3.Hotel industry has been given major relief by providing that the rate of tax on accommodation service shall be based on transaction value instead of declared tariff. 4.Services provided in sectors like banking, IT have been provided relief by exempting services supplied by an establishment of a person in India to any establishment of that person outside India [related party]. 5.As a green initiative, GST on supply of e-books has been reduced from 18 to 5%. 6.For details of major decisions on services, annexure to this press note may be referred. 7.It is proposed to issue notifications giving effect to these recommendations of the Council with effect from 27th July, 2018. Exempt services by way of artificial insemination of livestock (other than horses). Exempt warehousing of minor forest produces in line with exemptions provided to the agricultural produce. Exempt the works of installation and commissioning undertaken by DISCOMS/ electricity distribution companies for extending electricity distribution network up to the tube well of the farmer/ agriculturalist for agricultural use. Exempt services provided by FSSAI to food business operators. Reduce the rate of GST from 18% to 5% on the supply only of e-books for which print version exist. Exempt services provided by Coal Mines Provident Fund Organisation to the PF subscribers from the applicability of GST on the lines of EPFO. Exempt supply of services by an old age home run by State / Central Government or by a body registered under 12AA of Income Tax Act) to its residents (aged 60 years or more) against consideration up to Rupees Twenty Five Thousand per month per member provided consideration is inclusive of charges for boarding, lodging, and maintenance. Exempt GST on the administrative fee collected by National Pension System Trust. Exempt services provided by an unincorporated body or a non-profit entity registered under any law for the time being in force, engaged in activities relating to the welfare of industrial or agricultural labour or farmer; or for the promotion of trade, commerce, industry, agriculture, art, science, literature, culture, sports, education, social welfare, charitable activities and protection of environment, to own members against consideration in the form of membership fee up to an amount of one thousand rupees per member per year. Exempt Reinsurance Services provided to specified Insurance Schemes such as Pradhan Mantri Rashtriya Swasthya Suraksha Mission (PMRSSM) (Ayushman Bharat), funded by Government. Exempt services provided by Government to ERCC by way of assigning the right to collect the royalty, DMFT etc. from the mining leaseholders. Exempt the guarantees given by Central/State Government/UT administration to their undertakings/PSUs. Exempt GST on the import of services by Foreign Diplomatic Missions/ UN & other International Organizations based on reciprocity. Prescribe GST rate slabs on accommodation service based on transaction value instead of the declared tariff which is likely to provide major relief to the hotel industry. Prescribe GST rate of 12% with full ITC under forward charge for composite supply of multimodal transportation. Rationalize the notification entry prescribing reduced GST rate on the composite supply of works contract received by the Government or a local authority in the course of their sovereign functions. Rationalize entry relating to composite supply of food and drinks in restaurant, mess, canteen, eating joints and such supplies to institutions (educational, office, factory, hospital) on contractual basis at GST rate of 5%; and making it clear that the scope of outdoor catering under 7(v) is restricted to supplies in case of outdoor/indoor functions that are event based and occasional in nature. Supply of services provided by State and Central educational boards to students for the conduct of examination will be clarified to be exempt. To clarify that the courses run by private ITIs for designated trades are exempt under GST whereas non-designated courses are taxable. To clarify that GST on premium paid by the Governments for implementing Pradhan Mantri Rashtriya Swasthya Suraksha Mission (PMRSSM) (Ayushman Bharat) is exempt from GST. To provide clarification on the applicability of Service Tax / GST on services rendered by an Indian Architect- Consultant in relation to immovable property located outside India to Indian Diplomatic Missions/Posts abroad. To clarify to Auroville foundation that ‘maintenance’ paid by it to Aurovilians is not liable to GST. To insert an explanation in notification No. 13/2017-Central Tax(Rate) to define the term renting of immovable property. To clarify that certain services such as “deposit works(expenses for providing electric line/plant)” related to the distribution of electricity provided by DISCOM, attract GST. Extend the exemption granted on outward transportation of all goods by air and sea by another one year i.e. upto 30th September, 2019 as the relief to the exporter of goods. Place liability to pay GST on services provided by individual DSAs to banks/NBFCs under reverse charge on the buying banks/NBFCs. However, services by non-individual NBFCs (corporate, partnership firms) to banks/NBFCs would continue under forward charge, as at present. 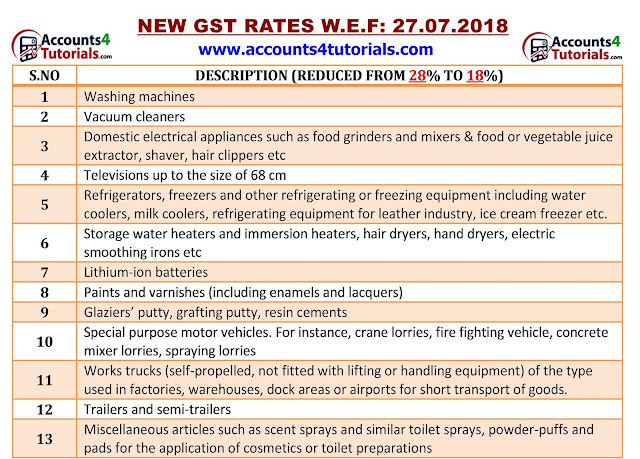 GST Council in its 28th meeting held on 21st of July, 2018 in New Delhi, approved the new return formats and associated changes in the law. It may be recalled that in the 27th meeting held on 4th of May, 2018 the Council had approved the basic principles of GST return design and directed the law committee to finalize the return formats and changes in the law. The formats and business process approved today were in line with the basic principles with one major change i.e the option of filing the quarterly return with monthly payment of tax in a simplified return format by the small taxpayers. All taxpayers excluding small taxpayers and a few exceptions like ISD etc. shall file one monthly return. The return is simple with two main tables. One for reporting outward supplies and one for availing input tax credit based on invoices uploaded by the supplier. Invoices can be uploaded continuously by the seller and can be continuously viewed and locked by the buyer for availing input tax credit. This process would ensure that a very large part of the return is automatically filled based on the invoices uploaded by the buyer and the seller. Simply put, the process would be “UPLOAD – LOCK – PAY” for most taxpayers. Taxpayers would have the facility to create his profile based on the nature of supplies made and received. The fields of information which a taxpayer would be shown and would be required to fill in the return would depend on his profile. NIL return filers (no purchase and no sale) shall be given facility to file the return by sending SMS. Council approved the quarterly filing of return for the small taxpayers having turnover below Rs. 5 Cr as an optional facility. Quarterly return shall be similar to main return with monthly payment facility but for two kinds of registered persons – small traders making only B2C supply or making B2B + B2C supply. For such taxpayers, simplified returns have been designed called Sahaj and Sugam. In these returns details of information required to be filled is lesser than that in the regular return. The new return design provides the facility for amendment of the invoice and also other details filed in the return. The amendment shall be carried out by the filing of a return called amendment return. Payment would be allowed to be made through the amendment return as it will help save interest liability for the taxpayers. 93% of the taxpayers have a turnover of less than Rs 5 Cr and these taxpayers would benefit substantially from the simplification measures proposed improving their ease of doing business. Even the large taxpayers would find the design of new return quite user-friendly. I. The GST Council in its 28th meeting held today at New Delhi has recommended certain amendments in the CGST Act, IGST Act, UTGST Act and the GST (Compensation to States) Act. Upper limit of turnover for opting for composition scheme to be raised from Rs. 1 crore to Rs. 1.5 crore. Present limit of turnover can now be raised on the recommendations of the Council. Composition dealers to be allowed to supply services (other than restaurant services), for upto a value not exceeding 10% of turnover in the preceding financial year, or Rs. 5 lakhs, whichever is higher. Levy of GST on reverse charge mechanism on receipt of supplies from unregistered suppliers, to be applicable to only specified goods in case of certain notified classes of registered persons, on the recommendations of the GST Council. The threshold exemption limit for registration in the States of Assam, Arunachal Pradesh, Himachal Pradesh, Meghalaya, Sikkim and Uttarakhand to be increased to Rs. 20 Lakhs from Rs. 10 Lakhs. Taxpayers may opt for multiple registrations within a State/Union territory in respect of multiple places of business located within the same State/Union territory. Registration to remain temporarily suspended while cancellation of registration is under process, so that the taxpayer is relieved of continued compliance under the law. c.Supply of goods in case of high sea sales. e.Goods or services which are obligatory for an employer to provide to its employees, under any law for the time being in force. In case the recipient fails to pay the due amount to the supplier within 180 days from the date of issue of invoice, the input tax credit availed by the recipient will be reversed, but liability to pay interest is being done away with. Registered persons may issue consolidated credit/debit notes in respect of multiple invoices issued in a Financial Year. Amount of pre-deposit payable for filing of appeal before the Appellate Authority and the Appellate Tribunal to be capped at Rs. 25 Crores and Rs. 50 Crores, respectively. Commissioner to be empowered to extend the time limit for return of inputs and capital sent on job work, upto a period of one year and two years, respectively. Supply of services to qualify as exports, even if payment is received in Indian Rupees, where permitted by the RBI. Place of supply in case of job work of any treatment or process done on goods temporarily imported into India and then exported without putting them to any other use in India, to be outside India. Recovery can be made from distinct persons, even if present in different State/Union territories. The order of cross-utilization of input tax credit is being rationalized. III.These amendments will now be placed before the Parliament and the legislature of State and Union territories with legislatures for carrying out the amendments in the respective GST Acts.